Leading up to training camp, as we did last year, we'll be comparing each of the Eagles' rookies to current NFL players. We started it off with No. 2 overall pick Carson Wentz. Today we'll tackle third-round pick (79th overall) Isaac Seumalo. Seumalo's primary position at Oregon State was at center, where he started since he was a freshman. In his sophomore season (2013), he moved to RT for two games after Oregon State suffered injuries along their offensive line. He broke his foot at the end of the 2013 season, which cost him the entire 2014 season. In 2015, Seumalo played RG and LT. He is a unique player who can play all five spots along the offensive line. A player with a similar college background was former Miami Dolphins 2007 second-round pick (60th overall) Samson Satele. At Hawaii, Satele's primary position was at center, but he also had extensive experience at LG and LT.
Satele's eight-year career began and ended in Miami, with stops in Oakland and Indianapolis in between. He started 114 games in the NFL, with his last season coming in 2014. During his career, he was primarily a center, although he also filled in at times guard. 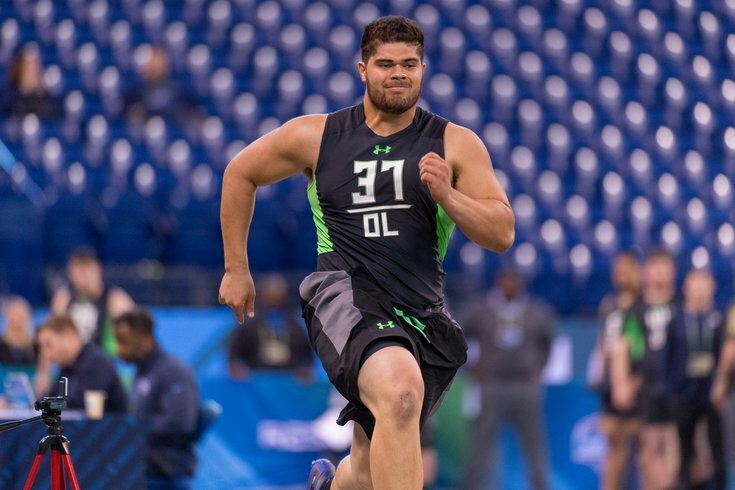 In the pros, like Satele, Seumalo's body type is not an ideal fit at tackle. He'll be an interior offensive lineman. While his best fit may be at center, Seumalo's best chance to play early in his career will come at guard, as the Eagles have Jason Kelce entrenched as the starting center and a LG job that could be up for grabs during training camp.